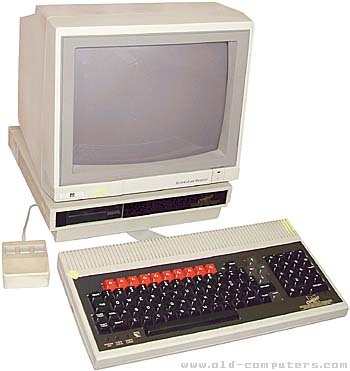 In 1986 the Acorn Business Computer range was long gone, and Olivetti - Acorn's new owners, having been forced to increase their stake from 49 to 80 per cent of the firm - were concentrating on making Acorn more profitable. The case for the 65C816-based Communicator was retained and given a basic box, housing a PSU and disk drive, to make a standard-looking 3-box computer system based around the BBC Master architecture. Also marketed in Europe as the Olivetti Prodest PC 128 S (S for Sistema), the Master compact differed from other computers in a number of annoying ways. Most confusing was the decision to keep the computer in the keyboard, with suitable reductions in available interfaces and features such as the real-time clock - making the Master Compact rather like a grown up Electron (however, home marketing would unfortunately not be attempted - it would have been considerably more successful). The 'CPU' was connected via a large ribbon cable and a jack plug. The monitor connected to the 'keyboard'. It was, to be blunt, a mess. Olivetti were to get their own back for the Compact - Acorn sold a branded version of the Olivetti M19 'PC Compatible', a rather dated 8088-based machine. The Olivetti Prodest 128 can be seen in the kid's film 'Treasure Island in Space' - an Italian production, most likely. The computer is recognizable by its blue and white display. POWER SUPPLY PSU Built in to base. PERIPHERALS Expansion units were produced, apparently. Came with 3.5'' 600K disk drive as standard. see more Acorn Computer BBC Master Compact Ebay auctions !